The sun beams, river flows and wind blows at an art gallery with neither wall nor ceiling. Hangang Art Park, situated at the Han riverside parks of Ichon and Yeouido, opened Aug. 25 with the aim of bringing art into the everyday. 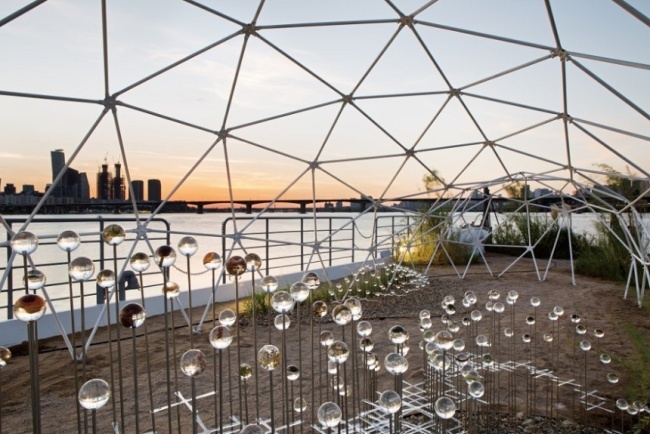 Under the theme of “Hangang: Art in the Flow,” the outdoor art installations reflect four keywords related to the river: lively, relaxed, inspiring and secretive. One of the exhibits has already attracted quite a bit of attention on the internet. 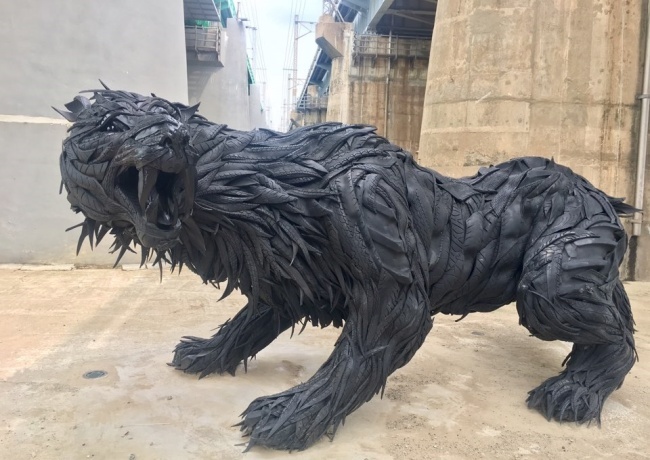 “White Bear” by Ji Yong-ho, contrary to its name, is actually a black bear created with waste tires. The upcycling artwork is on display under the Hangang Railway Bridge and the artist interpreted the deafening sound of the passing trains as a roar of the bear. Visitors are invited to sit on the bear’s back. As the park opened, there were criticisms that “White Bear” and some other works were “too artistic,” and the project had neglected the function of public art. “While most pieces were selected for public-friendless and aesthetic value, this piece is more for its artistry. Everyone can interpret art in his or her own way, what is pretty for one person may not always be pleasing for someone else,” said Hangang Art Park curator Seok Hye-won, who together with the project’s creative director Eun Byung-soo led a press tour Thursday. One must cross the river via the “Floating Pier,” feeling the flow of the river. “Floating Garden,” created by art team HDL, is decorated with numerous plants and flowers that live alongside the river, showing the riverside ecosystem. 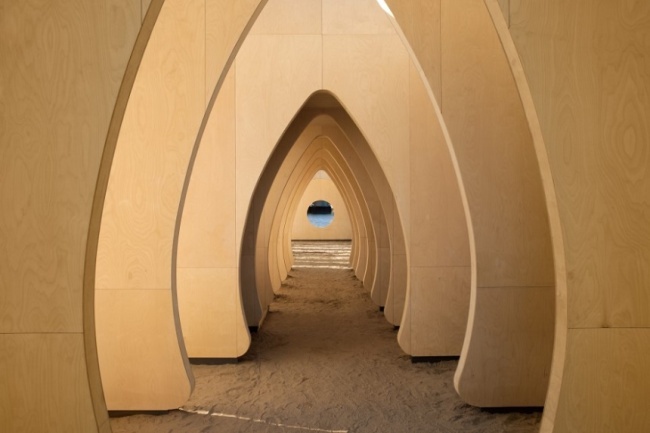 “River Pavilion,” produced by British artist Luke Jerram, is an artistic sum of wooden partitions with a rooftop on the second floor. The installation will be temporarily suspended after three months, due to a scheduled change in the water level. 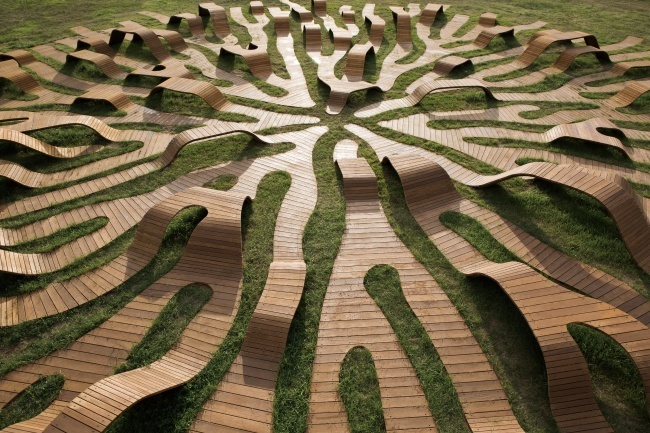 “Root Bench” by Lee Yong-ju is wooden furniture installed on a vast field of grass. Inspired by the roots of the park’s trees, visitors can lie or sit on the artwork. The piece was created at the suggestion of a citizen. Yoon Young-chul, head of Seoul Metropolitan Government’s Hangang Project Headquarters which organized project, explained that the project collected ideas from the public throughout the research process. One of the project’s aims was “co-creation,” he stressed. The 2 1/2-year project completed at the cost of some 10.2 billion won ($9.15 million) will be on display for three years, after which the city will decide whether or not to extend the exhibition. A promotional booth will operate at the park until Sept. 19 offering information on the project.